By Daniel Serra and Hanna Tunberg. In An Early Meal, Daniel Serra and Hanna Tunberg have (re)created a culinary journey through Viking Age Scandinavia. 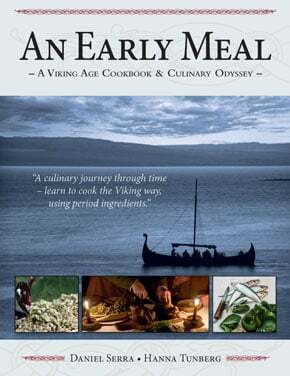 While no recipes from this era have come down to us, the authors have done an excellent, and very entertaining, job at giving “a plausible take on what could have been an Old Norse cuisine” (pg. 7). Combining information from archaeological finds, literary sources and experimental archaeology, the authors have recreated 6-7 recipes for each of seven different Viking settlements, ensuring that they only utilize the ingredients and cooking methods available to that particular place. The book begins with a general section outlining the kinds of foods and techniques that were possible. Some of their conclusions are as indisputable as they are surprising: for instance, the autumn and the winter were the seasons during which people had the most access to food. Each of the regional sections that follow (Lofoten, Kaupang, Lejre, Hedeby, Jorvik (York), Uppåkra and Birka), has a small introduction which traces the fictional journey and outlines the regional ingredients.The authors also take the opportunity to advocate for the use of local, heritage and sustainable ingredients as well as eco-aware cooking. Most of the recipes have accompanying pictures which look so good, you can’t help but want to try them. Some of them, such as the recipes for Skyr, ale, cheese or pit-roasted goat, require a great deal of time and effort, but others, such as the recipe for buttered turnips, might easily find their way into the diet of a university student or busy professional. Serra and Tunberg have provided a nice variety, to suit all levels of cooking skill and interest. The glossary at the back is particularly helpful when coming across ingredients such as bog myrtle. As a part of this review, I attempted two of the dishes contained in this cookbook, boar stew (pg.79) and buttered turnips (pg. 93). The stew turned out more flavourful than I thought boiled meat could taste, and the turnips were delicious and easy to make. The recipe was easy to follow with no time specifications, and is easy to adapt to account for personal preference. I substituted pork for boar and barley for wheat, both of which worked nicely. Overall, An Early Meal, is highly enjoyable and informative. It is well researched, including a brief bibliography for further reference, but is also a book that any non-academic Viking-enthusiast would love to have on their shelf or in their kitchen.